BEAUTIFUL AND DURABLE – Black synthetic resin wicker designed for the outdoors. Weather and UV resistant. Strong frame provides extra support and balance for the chairs. Stylish design and attractive colors look great in any setting. COMFORTABLE ROCKING CHAIRS – Thickly cushioned chairs for maximum comfort. Bottom cushion has zipper for easy removal and washing. Added rocking feature to rock yourself into a state of relaxation. ELEGANT GLASS TABLE TOP – Bistro set features an elegant glass top side table perfect for a couple glasses of wine or the morning coffee and newspaper. QUICK, EASY ASSEMBLY – Instructions and all necessary tools included for smooth assembly. SPECIFICATION – Includes 2 rocking chairs and a tempered glass side table. Chair dimensions: 25″ (W) x 26″ (D) X 28 (H). Coffee table dimensions: 18 (L) x 18 (W) x 19.25 (H). Packed in one carton: 29.2″ x22.9″x17.3″ GW/NW: 41.80/35.20 lbs. 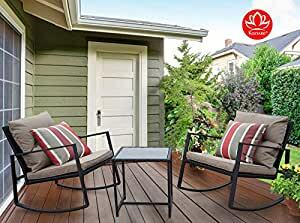 When it comes to having a pleasant conversation with your friends or family in your backyard or patio, you want to feel relaxed and comfortable. Kozyard Moana Outdoor 3-piece Rocking Wicker Bistro Set helps set the mood for you. It provides the perfect setting for sharing cocktails, watching the sun go down, or chatting with friends. Kick back, relax, and enjoy the smooth rocking glide while socializing with friends or indulging yourself in your favorite book. It is an ideal choice for outdoor spaces, such as the garden, porch or yard. All materials are treated to resist weather, rust and UV fading throughout the year. Brighten your outdoors with our Kozyard Moana Outdoor 3-piece Rocking Wicker Bistro Set and make the outside of your home just as inviting as the inside! All-Weather Resistance Made from high-quality resin wicker, our outdoor furniture is all-weather resistant so you never have to worry about it falling apart in rainy or cold climates. One Year Warranty and Prompt Support. We are based in Mercer Island, WA, United States. We are here to support you with one-year warranty and lifetime free phone consultation. Includes 2 rocking chairs and a tempered glass side table. Chair dimensions: 25″ (W) x 26″ (D) X 28 (H). Coffee table dimensions: 18 (L) x 18 (W) x 19.25 (H). Packed in one carton: 29.2″ x22.9″x17.3″ GW/NW: 41.80/35.20 lbs. Beautiful set. Well made and easy to put together. Came well packed with clear instructions. Sturdy and comfortable to sit and rock in. I love this style and it is so comfortable! I’ve seen a few different sets but this is definitely the best deal! And it shipped super fast!